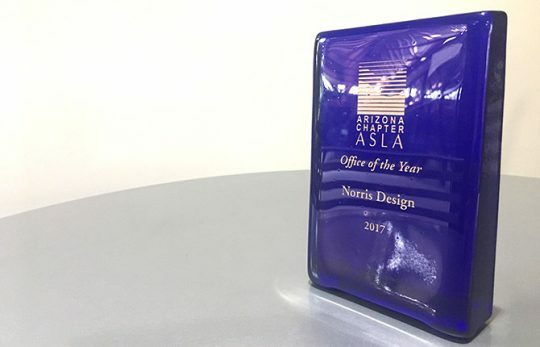 Norris Design, with offices in Flagstaff, Phoenix, and Tucson, won the Arizona American Society of Landscape Architects’ 2017 Office of the Year award. The award recognizes firms that have produced distinguished landscape architecture and made significant contributions to the local chapter, the profession, and their community. One of our projects – Yuma Medical Center’s Serenity Garden – also won an Honor Award for Design. We are honored to receive this recognition for our staff and our work.